Manage a busy work schedule, organize parties, and keep up with gift giving and holiday events with a Teamup Calendar and Teamup mobile apps. The holiday season is an important and special time for many, but it can also become stressful and overwhelming. For some, the workload becomes even more demanding over the holiday season. 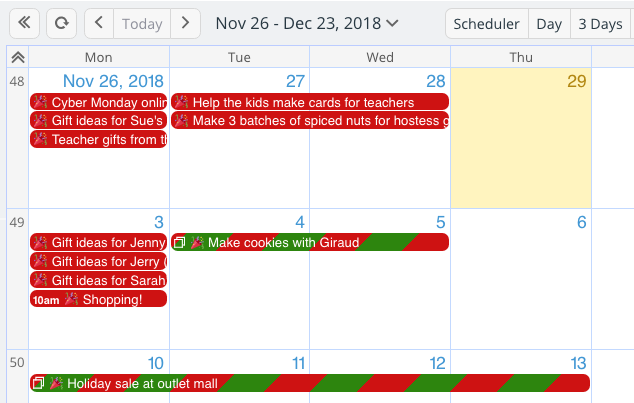 Don’t miss out on the joy and wonder of the season because of stress, inefficiency, or schedule conflicts: let Teamup Calendar be your guide and assistant for the busy holiday season. With Teamup mobile apps for both iOS and Android, you can keep your holiday schedule in order anywhere, anytime. When your normal routines are upended by school holidays, travel plans, and holiday events, it’s easier to make decisions and keep track of tasks if you can see everything in one place. Create a free Teamup Calendar for any area of your life. You may already have a calendar system for your workload, your personal and family life, and your involvement in organizations or community projects. If not, now is the time to get all of these things out of your head and into a trusted calendar system. You can create a free Teamup Calendar–or more than one, if needed. Take advantage of the powerful features for organizing, sharing, and collaborating on any area of your life, from gift giving to family events to staff scheduling. Note: you can try out the Plus or Premium plan for three days at no charge. The calendar will revert to the Basic plan after three days, if you do not subscribe to a paid plan. Just select Plus or Premium from the drop-down menu when you create your calendar. Put all events and possibilities, tasks, deadlines on a calendar. Don’t trust your memory! Your brain has more important things to do than remember all the details of events, to-do lists, and scheduling. A calendar is a powerful tool but only if you use it. Set aside some time to think about each area of your life. A notebook can be helpful here: for each main area or responsibility, spend 10-15 minutes writing down every task, project, event, to-do, note, or detail you have swimming in your mind. Then review the list, and transfer the things you want to remember to your calendar. Use iCal feeds to view all your calendars in one place. Here’s the tip that will make managing your life and work easier: pull all your calendars into one view by using iCal feeds. Being able to see everything, from every area of your life, in one view will give you a big-picture view and help you make better decisions. First, decide which calendar service you want to use as central planning calendar. Of course, we think Teamup is the best choice! But you can use this tip with other calendar services, too. Once you’ve decided which calendar to use, get iCal feed URLs from your other calendar(s). Then add each iCal feed URL as an iCal feed to your central planning calendar. Now you can see all the events, tasks, and other items in one place. Download the Teamup mobile app. Teamup mobile apps for both iOS and Android offer powerful features and on-the-go ability to manage and update your schedule. You can add multiple Teamup calendars to the mobile app and easily switch between them. 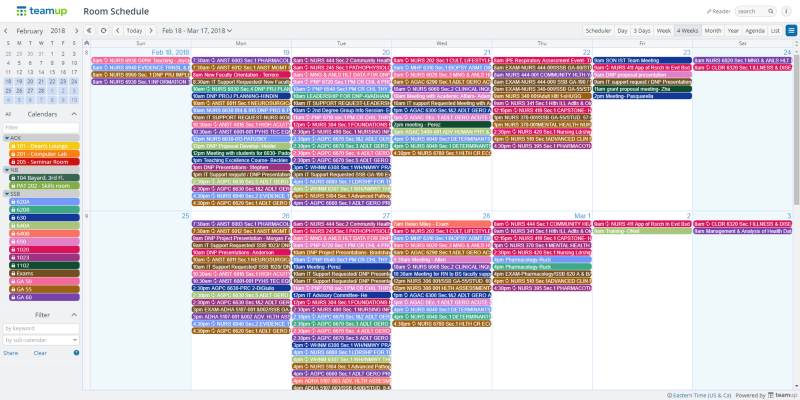 Be sure to include your central planning calendar, with all your feeds and schedules in one view. 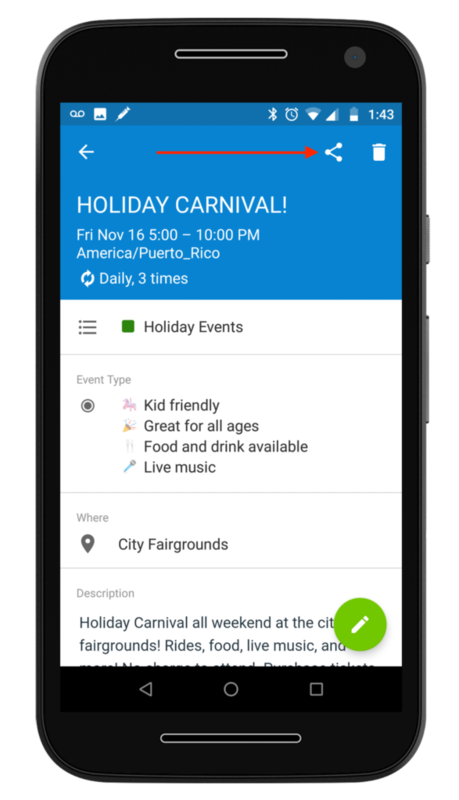 Features like event comments and event sharing options make it easy to plan and coordinate your holiday schedule and promote holiday events. Gift giving can be a meaningful exchange, but it can also become a source of stress and financial strain. To ease the stress and stay within budget, stay organized with your gift-giving. Create a sub-calendar dedicated to gift-giving. Add an event for each person on your gift list. You could make each event recurring until you purchase the gift. Or you could block out time for shopping, and schedule each person’s “event” for that time block. If you don’t get all the shopping done during that time block, you’d simply reschedule the people who still need gifts. 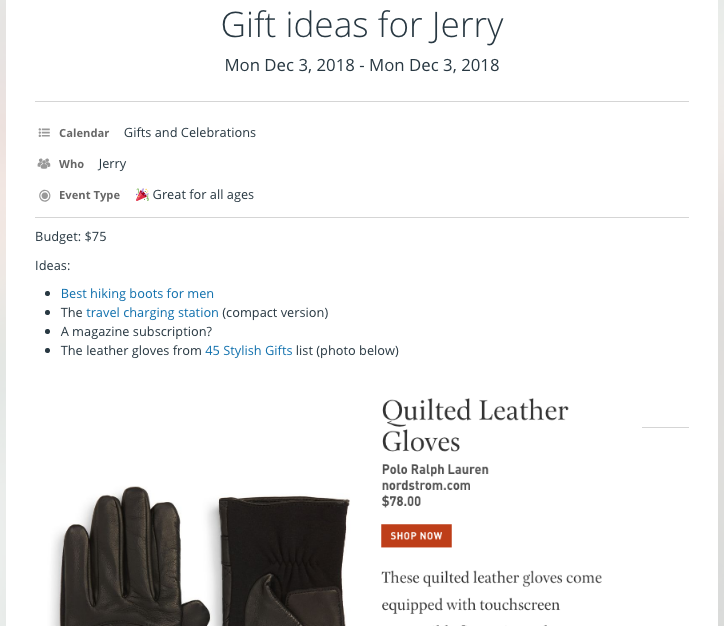 Use the event description and event fields to keep notes on your budget for each gift and on preferences, size, gift ideas, and other details. You can also save links or information on products, sales, or other gift ideas to the event, so it’s all there when you’re ready to shop. Keep the gift sub-calendar going all year. You can stay organized with gift-giving and celebrations all year. Add birthdays, anniversaries, and other days of note. Throughout the year, you can add gift ideas to each person’s event as you think of them. You can create events to remind yourself to purchase gifts, make calls, schedule get-togethers, or send cards. If you track sales or product releases, you can add these events to your calendar, as well. Spending time with family and friends is a highlight of the holiday season. Make planning easier with a shared calendar that’s easy to access for everyone. Plan meals, parties, and events together. 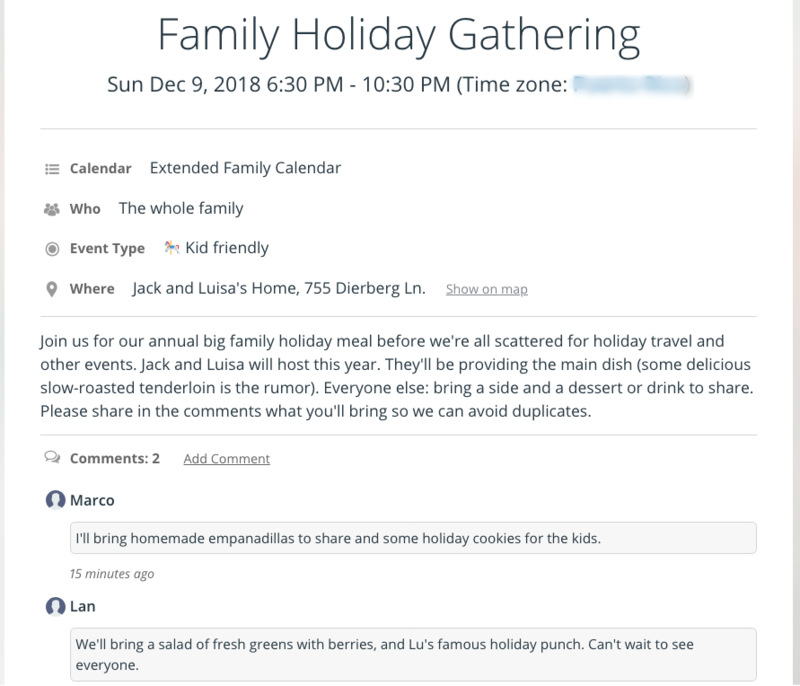 If you’re planning a holiday party, a big family meal, or even a community holiday event, a shared calendar will help you communicate and coordinate with less confusion. Don’t spend your time in endless text messages and email threads, hashing out the details of who will bring what. Instead, put it all on a calendar. Enable event comments and event signups, then share a calendar link with each person or family involved. Everyone can see plans, add information, and discuss options. And it’s all there for everyone to see; you don’t have to be the collecting and distributing information. Anyone with a calendar link can easily access the shared calendar via a web browser or on a Teamup mobile app. 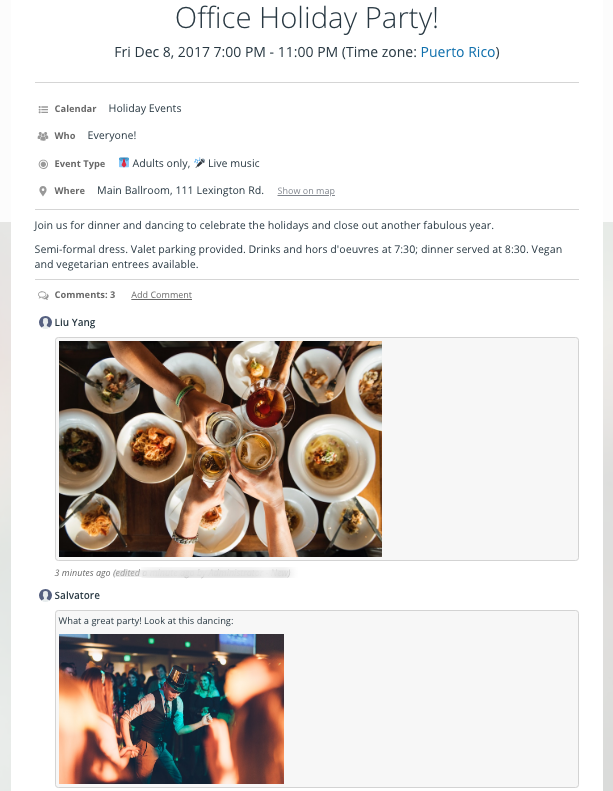 A holiday event, shared as a page, with comments enabled for All users to make discussion and planning easier. You can also easily use the event sharing options on mobile, or in the browser, to invite people to parties and other events. If space is limited, enable the event signup feature and set a maximum number. You can use event comments to field questions or suggestions, and any updates you make to the event will be shared on the event page so everyone stays updated with the latest information. Use a shared calendar or event(s) to coordinate travel plans. A shared calendar or event can make travel planning easier. Put all the details of your travel–such as your flight number, scheduled arrival time, and transportation needs–into an event on your calendar. Then you can share the event with anyone who needs to stay updated on your plans. Event sharing options on mobile make this process fast and easy. Even better, if you meet delays or have to adjust your plans, you can simply update the event rather than sending individual messages to multiple people. The event will automatically refresh with your updates, so anyone checking the shared event will see the updated information in real-time. 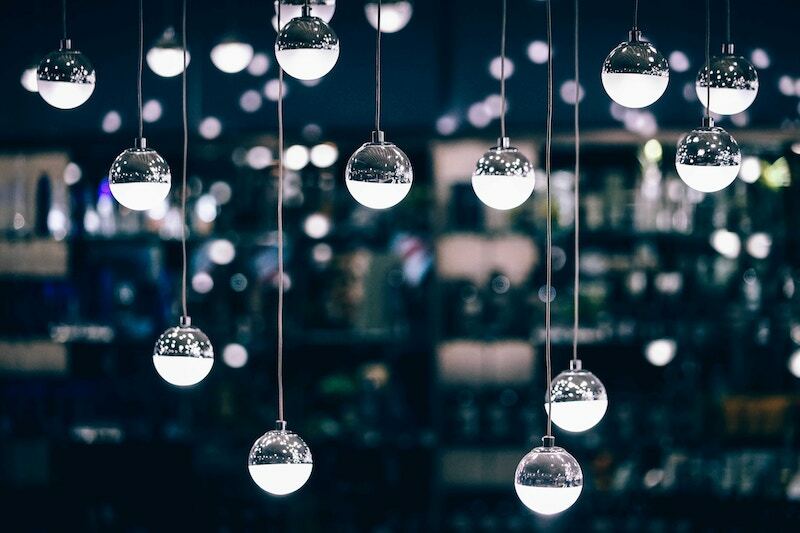 If the holiday season is busier than ever for your workplace, use Teamup to help conquer the chaos. You can manage a complex staff schedule, vacation time requests, and even appointment booking with a Teamup Calendar. Use a shared calendar to oversee your staff’s schedule. Use a Teamup Calendar to assign shifts, review time-off requests, and manage other scheduling needs for your workplace. The best part is that you can customize your Teamup Calendar to work for your needs, precisely. For instance, you could integrate an approval process into your staff calendar so that team members can input requests for vacation, particular work hours, or service assignments. Then you can review and approve requests all in one place, without any back-and-forth texting, messaging, or emailing needed. It’s a more efficient method for handling multiple inputs and keeping it all organized. Plus, with Teamup mobile apps, your team members can input their requests anywhere, using their mobile devices. And you, or any overseer, can review, approve, or respond to requests even when you’re on the go. Coordinate volunteers for events and charity work. There are many admirable volunteer events, charity drives, and community opportunities over the holidays. And many people become more aware of the needs around them during the holiday season. That’s great, but managing volunteer requests and scheduling can become a full-time job. 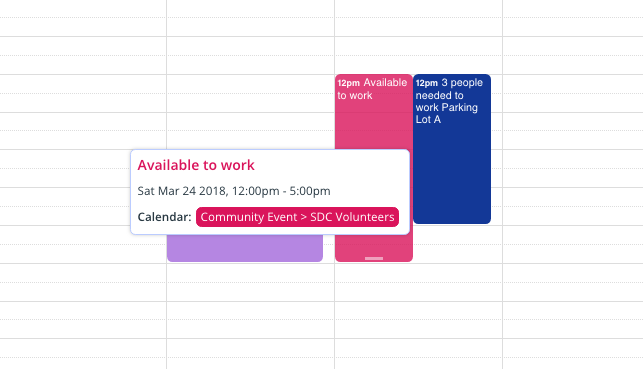 To keep it streamlined and efficient, you can set up a calendar to let volunteers input their own available hours, for example. Read about Immigration Voice, Age UK, or Look Good Feel Better for more inspiration. If you’re overseeing a rental venue or vacation properties, the holiday season is busier than ever. Use Teamup as a booking calendar to show availability and spend less time answering email and phone inquiries. You can also use Teamup to share appointment availability with clients. You can even embed a calendar on your website so people can easily see what’s available. If you want to run a special promotion, create an event for it, then share that event as a page on any social media platform or to an email list. For both work and personal events, keeping track of information, managing event details, and noting how things worked well (or didn’t) is invaluable. You can use Teamup as an internal notes system for projects, events, meetings, sales, or other activities. Your notes can help you make better plans and decisions, improve, and respond to feedback. Keep internal notes in the event comments. Event comments work well as an internal notes system. Enable comments, then set the comments to be visible only for users with modify permission. Calendar users with read-only or add-only permission will not be able to see the comments. You can then use the event comments as internal notes. Each comment is automatically date and time-stamped, as well. Since event comments are saved with the calendar event, they’re easy to find when you need to review your inputs or data for a particular event or project. Add files, photos, and details to the event description. The description box is a fully functional text editor. Not only can you leave notes, details, and instructions here, but you can also drop links, and upload photos, images, documents, and other files. If the calendar event is only being modified by one or two people, keeping all notes in the event description box can work well. If more people are involved, however, it can be confusing to keep all notes from multiple people in the description box. In that case, use event comments or custom event fields. Save links, images, and gift ideas on your Teamup Calendar. Encourage employees, clients, volunteers, and other event participants to leave comments on an event as they attend it; rather than filing those observations away, they can share their input on the event itself and everyone involved can benefit. If you need to gather a certain type of feedback, or want to use a rating system, you can ask a question or suggest a rating system in the event description. Ask attendees to respond in the comments and you’ll have all the feedback in one place. How fun would it be to have photos, notes, and quotes from many people involved? Whether it’s a community event, a volunteer effort, a shared family time, or a big party with friends, it’s more fun to have many perspectives. With event comments enabled for All users, anyone who sees the event page can leave a comment. They can upload an image to an event comment, as well, so everyone can share their favorite photos and moments. The resulting event page is a collection of memories that everyone can access and share easily, via the Teamup mobile apps (or on a web browser). You could even set up a display of the event page at the event to encourage people to add their memories. With many events and obligations, it’s easy to lose track of time and miss out on the special times that matter most to you and your family. A little time spent organizing can help you see all the opportunities and avoid conflicts. Get it all on the calendar. Sit down with your family and talk about the priorities for each person. When you can see everything in one place, you have a better idea of what you want to say yes to, and what you want to pass by. Remember, you’re in charge of your time! A Teamup Calendar can help you take charge without feeling confused or uncertain. Try to space out plans; give yourself buffer between big events and some downtime to relax. A coordinated, shared calendar is a tool to help you enjoy the magic of the season. Header photo by Fancycrave on Unsplash.